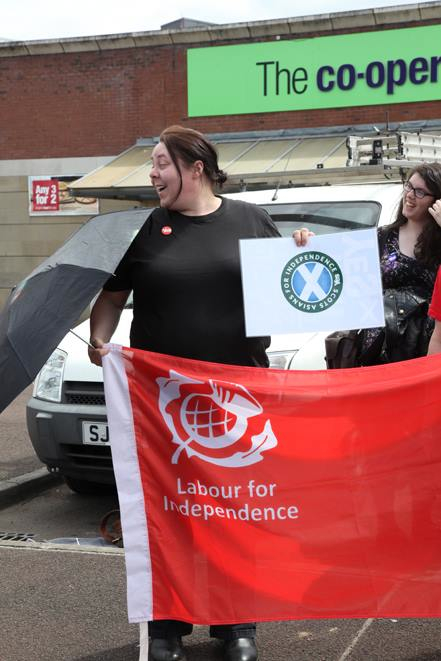 by Allan Grogan, Labour for Independence Other than the term nationalist, the term most commonly used by the no camp describing Yes voters is the term separatist as in to separate or create division. Yet it can be argued that this notion of division has been evident as part of the United Kingdom for the last 60 years. Since the end of the Atlee Government in 1951, the UK has gradually shifted towards a ‘Me First’ society. The theory behind this is that if the richest get richer then the wealth will trickle down to the poorest. Yet this is very rarely the case, that is why the UK is now the 4th most unequal society in the western world. How in this case do the people of a country so unfair and unequal not rise up? In order to continue this profligation, diversions have to be created to ensure the public do not focus on how corrupt the current system is. These diversions aided by right wing press such as the Daily Mail, take the focus away from the real issues and create a tension and separatism within society. Immigration is an obvious and lasting avenue for rationalisation of poverty and inequality. This is not anything new. In the ’50s unemployment was blamed on the Irish and Caribbean migrant taking jobs away from “British” people, this continued with Asian immigrants and now Eastern Europeans. Of course this pretence only goes so far and so in recent years politicians and the media have found a new channel for shifting the focus away from the real issues. Attacking the ‘undeserving poor’ is the way to ensure deep rooted divisions within the working class. This diversion has proved particularly successful thanks to an onslaught of political accusations and continual media enforcement of this. One needs only to look at the Channel 4 show Benefit Street to see the major attempts to create tension between the working poor and poor. Throughout this campaign I have met people who fully believe that the reason they are struggling is down to those who won’t or can’t work. The reality of the situation of course is very different. The UK has one of the lowest levels of social security in Europe. The fact that people who work 40 hours a week are receiving less than those on social security is not an indictment of unemployment wealth, rather the low paid, zero hour culture that is prevalent within our society. Yet this story is all too often untold, leaving those in abject poverty to fight over the scraps off the corporate table of wealth. The Labour Party used to stand up to these myths and fight for a more fair society, yet those days seem to be a thing of the past in Westminster. In the past, Labour used to raise funds for campaigns by going to the miners and social clubs. They used to work with the trade unions with the mutual interest of protecting the people who had elected them. Now far removed from their trade union links they host fundraising dinners at £1000 a table. Who can afford that? The same businesses and interest groups that seek to maintain the same cycle of me first politics. Scotland deserves better, a society which represents the needs of all not just those that can afford to have their say. The purpose of the Common Weal, is to create an ‘All of Us First’ society, ensuring that we tackle the real causes of poverty and inequality. Independence offers us this opportunity, the chance to say we will not tolerate excuses and diversions over real answers to social issues. The opportunity to say we will no longer accept playing off religions, races or genders against each other. That we can’t play off young against old, rich against poor, poor against the poorer, that there is a better way. On 19 September, after a Yes vote, the easiest thing to do would be to continue as a smaller version of what the UK is. But we deserve better than this, we can do so much better than this. Issues at the very heart of poverty and health issues must be addressed, jobs must be created, pride must be restored in all forms of employment. It won’t be easy, but nothing worth fighting for ever is. This campaign has seen the largest civic movement in recent history, millions of Scots yearning, demanding a better way, we owe this to them that we deliver on the ideals put forward in this campaign. Independence isn’t the destination, merely the beginning. The hard work starts there. The opportunity given to us with independence must not be squandered, we should make no excuses or diversions, we owe that much. I look forward to working with comrades within a real Labour Party, and members of all political parties and none in achieving a better way, a better Scotland and a better tomorrow.